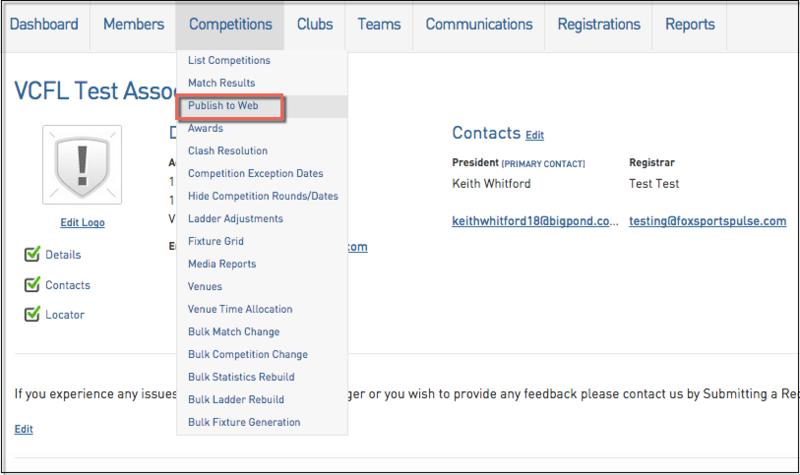 Associations are able to schedule a 'Publish to Web' which updates the Association website with details of Fixtures, Results, Ladders and Statistics. This allows uploads to be done to websites without the intervention of the Association secretary or competition manager and means that Fixtures, Results and Ladders are updated at the earliest opportunity and ensures everyone remains up to date and informed. A Publish to Web can be scheduled at any time however this simply means the time that the upload file is placed in the queue. It normally takes 5 – 10 minutes for the upload to appear on the website but this can be longer in peak times. 1. Hover over Competitions and click Publish to Web. 2. To schedule a Publish to Web, simply select the day and time that you wish for this to happen and click on the Add to Publish Schedule button. This will add it to the Schedule Times and at this day and time each week, a Publish to Web will occur. 3. To remove one of the Scheduled Times, click on the Trash Can to the right of the time you wish to remove. 4. 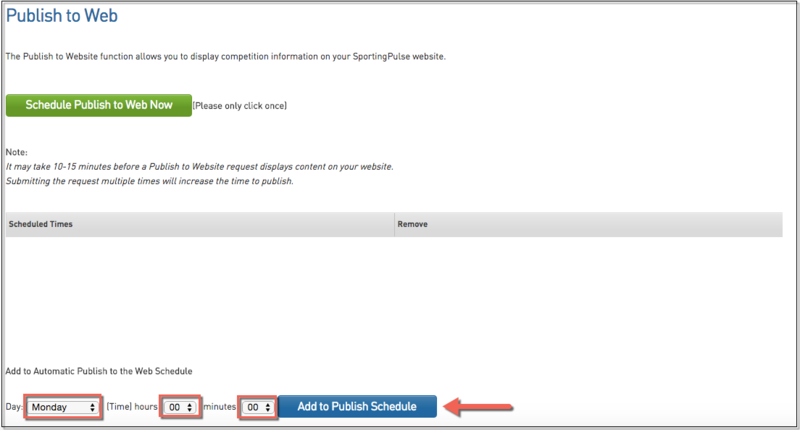 Publish to Webs can also be done immediately by pressing the Schedule Publish to Web Now button. This will do an immediate upload of all competition's Fixtures, Results, Ladders and Statistics. This may be helpful if there is an important fixture or result change that needs to be updated sooner than usual.